Who should apply to this market? As the intent of this market is to celebrate our local community, only local, Athens-area businesses, professional artisans, etc. will be considered. If you have questions, please email madeline@ccbeerco.com prior to applying. No, this will be an outdoor market, rain or shine. Will this market be in Creature Comforts’ courtyard? No, this market will be on the street. Please note: Creature Comforts has applied to the city of Athens to close West Hancock Ave (the block in front of the brewery) for this community market. The market is contingent on city approval. If the request is rejected, all vendor application fees will be refunded. Does applying guarantee that I will be in the market? No, applying does not guarantee selection for the market. Market space is limited. All must be acknowledged in the online vendor application in order to be considered for the market. If you have questions you would like answered before applying, please email madeline@ccbeerco.com and we will do our best to respond within 2 business days. Vendors must provide their own 10x10-foot tent AND tent weights and 6- or 8-foot table, along with any other display materials or signs required to operate. Booth sharing between vendors is not permitted. One 10x10-foot tent is the vendor's entire allotment for the duration of this event. Signs and displays cannot extend beyond this allotment, as this may be unsafe and violate the event's fire code. Creature Comforts reserves the right to deem any signs or displays outside of your 10x10-foot booth area unsafe or inappropriate. Vendors must provide their own staff, at the vendor's own expense, for the duration of the event, including set-up and breakdown. Vendors should plan to maintain adequate staff to ensure organizational flow at the event. Vendors are responsible for their own set up and breakdown. This includes but is not limited to tent, tables, tent weights, displays, etc. Vendors must arrive at least one hour prior to event start time to set up or they may not be permitted to set up. This event starts at 11am, so vendors must arrive no later than 10am. Vendors are not to break down early (prior to the 7pm market close). Vendors have one hour after the market closes to break down their booth entirely (until 8pm). However, if you must leave early because of a special circumstance or emergency, please inform a Creature Comforts staff member before breaking down. Vendors will be responsible for maintaining their allotted space in a clean and orderly manner throughout the duration of the event. Vendors will also be responsible for all trash removal within their allotment at the close of the event. Trash and recycling bins will be provided in the vicinity. Violators may be subject to a $100 fee. Vendors are required by Georgia State Law to pay sales tax on any revenue made from events/markets. Vendors are responsible for claiming income tax. Creature Comforts Brewing Co. does not assist with this. Creature Comforts will not provide electricity to vendors. You will not be permitted to run cords or wires from your booth to an outlet. That is a safety hazard. Vendors will have access to bathrooms/porta potties. Wi-fi access will not be provided by Creature Comforts Brewing Co. If you are accepted as a vendor, Creature Comforts Brewing Co. has the right to use images of your items, logos, signage, and likeness, as well as your name, for promotional purposes. A nonrefundable application fee ($10) must be submitted with the vendor application online. This is the only accepted form of payment for this fee. If you are accepted as a vendor, an additional booth fee ($60) will be due within one week (7 days) of vendors’ acceptance notice or the vendor’s spot may be given to someone else. This additional fee can only be paid online through a separate form to be distributed upon acceptance notice. If you are accepted and cannot participate in the event after paying the booth fee, you may be refunded 50% of the booth fee only if you notify Creature Comforts in writing by Friday, April 5. Otherwise, no refunds will be issued. No-shows will not be issued a refund. Event is rain or shine. Vendors are expected to come prepared for the elements. If you feel unsafe setting up in inclement weather, you will not be penalized; however, no refunds will be issued. If the event is cancelled due to severe weather, Acts of God or anything outside of Creature Comforts Brewery’s control, refunds will not be issued. If you are accepted as a vendor, you release Creature Comforts and all its affiliates from any damage to your person or property that may occur as a result of participation in Creature Comforts Brewery 5 Year Anniversary Celebration. We make every effort to provide a secure environment. You are solely responsible for all your belongings, including your tent, tables, chairs, valuables, goods and vehicle. Creature Comforts Brewery nor any of its affiliates are liable for any injuries that occur during the event, including the setup and breakdown portion of the event. Ashley Anderson’s Family Computer: Familiar Interiors showcases a new series of pixelated cyanotypes that pays homage to the intertwining histories of art and video games. A follow-up to the Atlanta based artist’s exhibition Family Computer Family Portrait (Kibbee Gallery, Atlanta, October 2018), Familiar Interiors focuses on landscapes in classic home video games and encourages a consideration of how humans interact with digital space. The eleven scenes represented in this show should look familiar to those who grew up playing early home video games like Duck Hunt (1984) for Nintendo Entertainment System (NES), though slightly modified. Anderson digitally collaged background elements from the video game sources to create original images that feel more like imperfect memories than screenshots. In some cases, the “re-compositions” quote specific historical works of art: “Wheatfield with Duck Roost (27 July 1890)” is loosely based on a Van Gogh painting, while the puddle in "Deep Blue Bayou” references an M.C. Escher print of a reflection in a tire tread puddle. It was Anderson’s love for painting and art history that drew him to the cyanotype process, being a form of photographic printing reliant on brushwork: paper is coated with a sun-sensitive chemical mixture, the exposure of which causes the paper to turn blue. An overlain negative will block the exposure to varying degrees, resulting in a blueprint-like image. Full of callbacks to real-world art and imagery from classic video games, Familiar Interiors leads viewers to examine their own layered experiences of reality: physical to digital to conceptual and back. 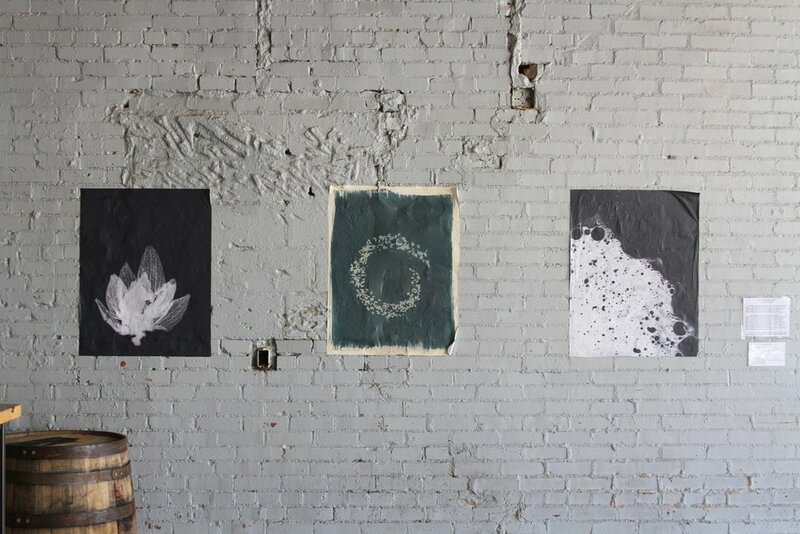 Anderson will lead a cyanotype workshop at the brewery on the exhibition’s closing day, Sunday, March 24. Pre-registration will open online in February. All the exhibited works of art are available for purchase at the brewery through the closing day (March 24), with 10% of proceeds supporting Creature Comforts’ Get Artistic nonprofit fund. The Head and the Art was organized by Taylor Newman (PhD student in Foods and Nutrition) and Megan Prescott (PhD candidate in Microbiology), both at the University of Georgia. The exhibition was funded by a COMPASS Outreach Grant through the American Society for Cell Biology. It was originally displayed at the University of Georgia Science Library in late November. The statement below is from the exhibition organizers. Both science and art seek truth and understanding through creativity, problem solving, innovation, and experimentation. Science makes the invisible visible. Art makes the unknowable knowable. Together, there is no limit to our ability to understand the world around us. The Head and the Art is an interdisciplinary collaboration that pushes the limits for a better understanding of science and art. We paired 7 local scientists and artists for various science-inspired works. Our pieces cover topics ranging from forest entomology to mindfulness and psychology, using mediums equally across the board— metalsmithing, weavings, and even tattoo drawings. We also have pieces from 5 individual artist and scientist contributors, as well as work from local chemistry and art students. The goal is to appeal to those who do not usually engage with science through art that is both informative and interactive. To quote Carl Sagan, “Not explaining science seems to me perverse. When you're in love, you want to tell the world.” We hope this exhibit inspires you to fall in love with science, and see that art and science aren’t so different after all. Check The Head and the Art on Facebook and @designingscience on Instagram to see behind the scenes of The Head and the Art. For art purchase inquiries or general questions about the exhibition, please email Creature Comforts’ Get Artistic Program Lead at Madeline@ccbeerco.com. As a company committed to helping others pursue their passion, we aim to leverage our brand and spaces to remove some of the barriers of working artists. Out of this aim, we created and launched our second community-oriented initiative, Get Artistic, in June 2018. The 2018 campaign wrapped-up on December 12 and we’re thrilled to announce we generated $16,815 to be distributed among six targeted grant opportunities in the local arts community. The following were recipients from the funds generated throughout the 2018 campaign: the Athens Symphony Orchestra, ATHICA, Canopy Studios, Athens Rising Vol. 2, Town & Gown Players, and the Athens Area Arts Council. Madeline Bates, our Get Artistic lead, thanks the local community for their support of Get Artistic this year. Photo by Matt Hardy Photography. “We were incredibly excited to launch this program earlier this year,” said Matt Stevens, Creature Comforts’ Director of Community & Culture. “For one, it lands squarely in the center of our company’s purpose, which is to create enjoyable experiences, to inspire people to pursue their passions and to encourage people to care for their communities. 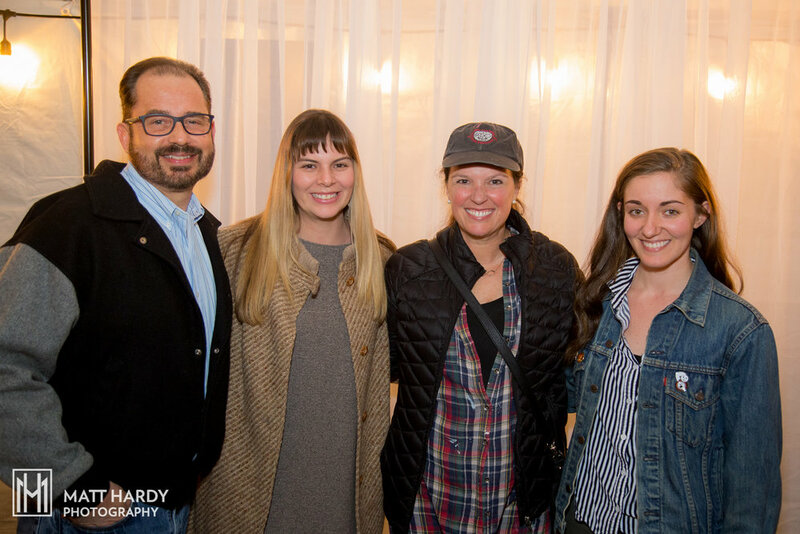 Madeline with the Town & Gown Players, one of the 6 recipients of the Get Artistic funds generated during 2018. Photo by Matt Hardy Photography. The mission of Get Artistic is to find creative ways to add value to the local arts community, beginning with six primary avenues of support: 1) leveraging the Get Artistic Lead staff member to curate exhibition and performance space onsite; 2) offering strategic grant proposals; 3) patronizing local artists: both as-is and commissioned works; 4) providing long-term patronage (e.g., artist residency programs); 5) creating onsite enrichment opportunities for the arts community; 6) supporting nonprofit and government-funded arts programming. Matt Stevens, our Director of Community & Culture, thanks everyone for attending our Get Artistic wrap-up celebration. Photo by Matt Hardy Photography. We raised the funds through the initial release of our Get Artistic beer and merchandise. Inspired by white wine, the classic drink of art gallery receptions everywhere, the Get Artistic beer is a tart wheat beer brewed with Sauvignon Blanc grape juice at 6% ABV. To learn more about Get Artistic and our other community impact programs, visit www.GetCurious.com. Header photo: Madeline takes a photo with the Athens Symphony Orchestra, one of the 6 recipients of this year’s Get Artistic funds. Photo by Matt Hardy Photography. Dibujos orgánicos: hecho a mano exhibits a new series of drawings and paintings inspired by geometric shapes in nature, particularly the fruits, vegetables, and plants found in Colombia. The series explores how growth, in seeds as in art, thrives in the equilibrium of structure and spontaneity. Handmade suggests a unique and imperfect creation, perceived as of superior quality. Join us for the Meet the Artist: Angie Jerez event on Sunday, December 9 from 1 to 5pm! Visitors are invited to work alongside the artist, who will be painting two repurposed fruit barrels that will be used to collect rainwater at the brewery. Jerez will also be releasing a limited-edition print at the event. The Gift features nearly fifty individual works of art from more than two dozen Athens and Atlanta area artists, organized with help from Athens-based Athulhu. Most of the show’s contributors are “Free Artists”—those who regularly leave their art in public spaces, a gift for whoever finds it. The show also features the work of four artists from Athens—Brown, Freeman, Kregel, McCracken—who don’t usually participate in the Free Art movement but were invited because they have an interest in public or communal art experiences. Many (but not all) of the works of art on view will be “dropped” in the Athens area after the exhibition closes, the weekend of October 19th - 21st. Though Free Art was started in Atlanta by the artist known as Evereman (featured in this show), it has been slower to catch on in Athens. There are roughly ten Athens-based artists who are known to regularly contribute Free Art—relatively few compared to the dozens who are active in Atlanta. The Gift strives to increase involvement while prompting renewed considerations of the cultural and societal value of art. · Inclusive: anyone can join the fun! Becoming a Free Artist is as simple as creating and sharing a work of art. Many artists utilize social media to share their Free Art work and ask that the finders comment to “claim” the work online. · Accessible: art is left (or “dropped”) in public spaces for anyone to collect and keep. Many artists use their art drops as an opportunity to encourage people to explore lesser traveled parts of their communities. · A gift: artists contribute their time, materials, and creativity to share their work with the public; nothing is truly “free” about its production. Many artists prefer the term “Gift Art” to “Free Art”. Accelerated through social media over the last decade, the Free Art movement has been propagated in cities around the world. Much like social media itself, the Free Art Movement has become a vehicle by which thousands of artists and art lovers connect to one another on a global scale. Free Art is widely recognized as a sort of Instagram-enabled art treasure hunt, but the spirit of the artist’s gift that the art embodies runs deeper than the game element. The works of art on view are a mixture of Free Art and pieces that are exhibition only, meaning it will not be “dropped” in the Athens area after the show and may be for sale through the artist. This combination is intended to exhibit the idea that there is no distinction between “Free Art” and “sellable art” beyond the artists’ choice to donate it to their community. Only through conscious, continued effort can the spirit of the artist’s gift survive in any artform. Consider this an invitation. Mark your calendars for The Gift’s closing reception, which will feature Free Art activity stations with artists such as Evereman, Athulhu, sQuishiepuss, and many more! Saturday, October 13, 2018 from 7-10pm. Check our social media channels for details soon. David Hale is a Georgia-born, Athens-based artist working under his studio name, Love Hawk. Though he is best known for his deeply spiritual tattooing practice, Hale has shifted his focus to painting and printmaking over the last year. The paintings on view are all new, most created between April and June 2018. Each of the prints are part of very small editions (fewer than seven), but each features unique, hand-drawn elements or custom colors. All frames and mounts were handmade by the artist. The artwork will be for sale exclusively through Creature Comforts’ online merchandise shop, with 10% of total proceeds to benefit Creature Comforts’ new community outreach nonprofit fund, Get Artistic. Lucy Bone is a photographer from Columbus, GA. The weight of history holds an important place in Bone’s work, evident in her specialization in the antiquated medium of film and thematic influences from her life in the South. Bone’s work revels in symbolic color and reflective spaces that retain universal yet intensely personal experiences. She holds a BFA in Photography from the University of Georgia, and now resides and works in Athens. A while ago my twin sister asked me if I was aware of the Velvet Ditch. She told me, it’s a comfortable place that is hard to crawl out of. This stemmed from a conversation she, and a lot of people around me, have been having lately about educational, emotional, and literal growth in this period of my life neither on my own nor completely with someone else. These photographs center on memories and projections that reoccur in this time of limbo. They point towards the comfortable southern culture that I have become accustomed to, and now the reluctant need to grow out of it. The photographs depict pressures of job offers, mixed with childhood memories of pecan gatherings, and quiet moments of living alone for the first time in my life. While trying to come to terms with needing to crawl out of this ditch I cannot help but recall the dichotomy present in the Greek myth of Arcadia, a wilderness home where imperfection is a requirement for bliss. This work brings up a similar tension - how stress, worry, and discomfort are required for the existence of accomplishment. Themes of growth pervade the series, embodied as images of job security and friends who have been blessed with it, tomato plants I see myself in, and others who find themselves in my situation. Also saturating these images is the color green. The color of landscapes and kudzu and the other lush foliage so common in my childhood, but also the color of jealousy. Jealousy of how everyone makes growing up seem effortless, and jealousy of all who have followed the rabbits through the hole in the brush and escaped the ditch quickly and quietly. But prosperity also finds itself inside my green. The prosperity of my community, uplifting and encouraging, help me lift my head up just high enough so I can see the road that lies on the other side of the ditch. noises in the shower, endless rewriting of cover letters and job applications, but also to a higher idea of achievement, the color green, and the Velvet Ditch that I’m lucky to have in the first place. The works on view are archival inkjet prints shot with Mamiya 7ii using 120mm Portra 400 film. All nine prints are for sale through Creature Comforts’ online merchandise shop through Sunday, June 17, 2018. Frames are included in the prices below. Prints are available in varying sizes ($25–65) directly through the artist. Please email curious@ccbeerco.com and your inquiry will be directed to the artist. The Broadside Exhibition Project: verse 1 is the first in a new annual exhibition series that pairs local poets and artists to create original illustrated poems. Created through these collaborations, the fifteen broadsides that comprise verse 1 represent the creative diversity of our community. One part gallery show, one part public art project, verse 1 originals will be displayed in the CCBC Gallery, while poster-sized reproductions will be installed around Athens and on display through April 1, 2018. The series will subsequently be transferred to Hendershot’s and on exhibition until the end of April. Out of the dozens of Athens- and Atlanta-based applicants, Creature Comforts selected 15 artists and 15 writers to collaborate on the broadsides (one per pair). The pairings were blind, meaning the artists and writers did not know whom they would be partnered with, and most partners did not know each other previously. The fundamental intention of this project is to promote communication and connectivity within our community by prompting creative strangers to work together. The original works of art will be for sale through Creature Comforts’ online merchandise shop. Don’t miss out on this opportunity to bring local art into your home or the home of a loved one!  Athens Art Prints is a program by Pixel & Ink Studio to make high-quality artwork reproduction services more accessible to local artists. Call for Artists: EARTH Party! Since April 2015, in honor of Earth Month—which encompasses Earth Day on 4/22—Creature Comforts has hosted events and art exhibitions to celebrate our planet. Our hope is that, in the same way art can inspire us to feel, think, and respond in ways that better ourselves, these events will perhaps remind our visitors of the responsibility we share as caretakers of the environment. The Earth has been good to us. Let's be good to it. This year, we’re doing something a little different. In partnership with the University of Georgia’s Office of Sustainability, Creature Comforts is proud to present EARTH Party on Sunday, April 15, 2018 (1–6pm). The event will incorporate a one-day-only pop-up show of artwork celebrating our incredible world at Creature Comforts’ downtown taproom. This pop-up show will be curated by the Office of Sustainability’s current Artist-in-Residence, Kira Hegeman, and Madeline Bates, Creature Comforts’ in-house curator. Accepted visual art mediums: drawing, painting, prints, photography, sculpture, textile, mixed media, etc. You must have the availability and transportation to get your artwork to Creature Comforts’ downtown taproom between Wednesday, April 11 and Friday, April 13, with no exceptions. Artists must also take their work home with them by Monday, April 16. Your artwork must be ready to display: mounted in a frame or a comparable device with wire strung across the back. If your work is a sculpture, it must have the stability to rest on a designated table without additional support. Artwork that is not in ready-to-display condition will not be accepted. If you are eligible and interested in participating, please apply through the link below by Friday, March 30, 2018. Late entries will not be accepted. Notices will be sent out by Wednesday, April 4, 2018. Apply here by March 30, 2018! In need of a little environmental art inspiration? Check out two of the past Earth Month exhibitions in the CCBC Gallery! April 2017: Wheat-pasted print installation by Jen Holt (silver photograms, scanned and printed) and Madeline Bates (cyanotypes, scanned and printed), exploring the life cycle of the fundamental ingredients in beer. April 2016: Installation by the A4P (Air Purifying Plan Proliferation Project, a student-run organization of the University of Georgia; plant stand and paper sculpture) and photographer Rinne Allen (cyanotypes and van Dyke brown prints). Dr. Chris Greer is a Professor of Instructional Technology at Georgia College (Milledgeville) specializing in digital media and emerging technologies. Though he’s been taking photographs since the age of 10, Dr. Greer began using drones for his photography in last three years, seeking to capture viewpoints that would be impossible without the use of this technology. Dr. Greer has created content for institutions across the state, including the city of Athens, the University of Georgia, and Explore Georgia (the state’s official tourism office). In partnership with the Georgia Department of Natural Resources (DNR), Greer recently published “Georgia Parks and Natural Resources”, the first digital textbook on a state park system in the United States. Greer is an avid traveler and has taught digital photography and media productions around the world, including Italy and Australia. Check out aerial photos from Georgia and his travels on his Instagram account, @upabovegeorgia. Meet the Artist: Dr. Chris Greer, Sunday, February 25 (1–4pm): The next installment in Creature Comforts’ monthly Meet the Artist series features Dr. Chris Greer, accompanying his exhibition in the CCBC Gallery. Dr. Greer will spend the afternoon at the brewery demonstrating how he utilizes drones for his photography, transmitting a live-stream video from his drones to the brewery. Come out to the brewery to learn about this exciting technology and gain a new perspective on Athens with this local innovator! CCBC Gallery: Call for Artists! The Broadside Exhibition Project: Verse 1 has been rescheduled from November 2017 to March 2018. The application deadline will be extended to January 7, 2018 in an effort to allow more local artists and poets to participate. All applications received thus far will remain on file through the deadline extension. Organized by Creature Comforts’ Get Artistic program, The Broadside Exhibition Project is an annual show of curated collaborations between poets and artists. The project's first iteration, Verse 1, will be displayed across multiple locations in Athens, GA in November and December 2017. Up to twenty pairs of poets and visual artists will be selected to collaborate and create original broadsides together, which will be displayed in the mini-exhibits around town. This is an exciting opportunity for artists to work across mediums– from visual to writing and back– and grow with their community into new creative territory. So, what is a broadside? At first glance, a broadside reads as a poster: a large print featuring a combination of text and images that is, significantly, displayed in a public space. However, broadsides serve an artistic purpose beyond the didactic utility of posters. Broadsides provide a uniquely communal experience of a form of art that is typically enjoyed privately and intellectually, as in a book of poetry. The Get Artistic program aims to create opportunities for Creature Comforts’ community and consumers to connect with art in dynamic ways. Get Artistic brings people together, with art and with beer, in order to strengthen our community bonds and enliven our creative spirit. This is why The Broadside Exhibition Project: Verse 1 is one part gallery show, one part public art project. The online application for poets and visual artists will be open through September 30, 2017 or until up to twenty poet/artist pairs are selected. Collaborations may be assigned on a rolling basis or, at the latest, by October 7. Design collaboration and printing will take place in October. Because of the time-sensitive nature of the collaboration project, only submissions by poets and artists local to the Athens area will be accepted. Please fill out the online application, linked below, to be considered for the project. Both poets and visual artists must submit examples of their work to apply. Applications must also include a statement of intent, relevant background information, and links to online portfolios, if possible. Please feel free to contact us at curious@ccbeerco.com with any questions. Inspired by her passion for travel, color, architecture, and natural beauty, René Shoemaker has been painting on silk for thirty-five years. The Athens based artist has spent much of her life traveling and studying how people interact with place, weaving their lives through spaces they occupy. After retiring from her position as Library & Gallery Director at the University of Georgia, Shoemaker began a full-time commitment to her art. On Sunday, November 12, please join us for Creature Comforts’ next monthly installment of Meet the Artist, featuring René Shoemaker. The artist will provide hands-on demonstrations of her silk painting process inspired by her travels around the globe. Don’t miss this free-of-charge opportunity to Get Artistic! Shoemaker has documented her art and travel both in words and photos on her blog, located on the artist’s website. We recommend checking out the conversation between Shoemaker and local artist and curator Hope Hilton, in which the two artists explore the meaning of place, the beauty of an unplanned journey, and Shoemaker’s newfound community in France. All of the works of art on view in the CCBC Gallery are for sale. For purchase inquiries, please contact the artist directly at rene.shoemaker@gmail.com or by phone at 706-424-4739. All general inquiries about Creature Comforts or the CCBC Gallery may be sent to curious@ccbeerco.com. Thank you to Louisa Powell! Visitors to the tasting room in the last year will have noticed the peculiar fixture that is Outflow, an expansive sculpture of foam, plaster and conduit piping created by the formerly local, contemporary artist Louisa Powell. After this weekend, the sculpture will be removed to make way for an exciting upcoming renovation in the tasting room. Saturday’s public tour (January 9, 1-4pm) will be the final opportunity to view the sculpture. Louisa, her friends and family will be present for a closing reception to celebrate the curious life of this work of art. Installed in January 2015, Outflow was the product of four months of careful layering, carving, sanding and painting of various types of foam to create the sculpture’s main body, an intricate network of caverns and crevices. When this portion was completed and installed at the brewery, Louisa fixed upon the wall conduit piping that emerges up and out of the foam body, effectively blending the imaginative and artistic with the mundane, functional elements of the space. Outflow is a one of Louisa’s sculptural “site interventions”, an artistic response to an architectural interior that takes shape in the creation of a site-specific structural system. Louisa’s sculpture fuses non-functional artistic elements with the existing, operative components of the space to blur divisions between form and function, or between “art” and “non-art”. In this way, Louisa poses the work of art as an integral, interactive element of the space and prompts the viewer to consider the experiential value of encountering a work of art. Represented in this blending of sculptural elements, the breakdown of the divisions that guide our typical mental processes serves as the foundation for Louisa’s work and her creative process. The sculpture was installed between the tasting room entryway and the smaller bar, positioning it as one of the first elements of the space viewers encountered. The title Outflow reflects the important influence of Louisa’s recent discovery of the work of Mihaly Csikszentmihalyi, a leading proponent of positive psychology. “He has devoted his life to the study of a phenomenon that came to his attention in the 1970s called the ‘optimal experience’ or the ‘flow state,” Louisa commented. “The terms refer to a state of extreme fulfillment described by participants across diverse disciplines that can only result from their complete engagement with the task at hand." Outflow, then, can be seen as an embodiment of Louisa’s creative “flow state” responsible for the sculpture’s production. Along the same lines, Outflow represents the spirit of passion, creativity, and curiosity that Creature Comforts hopes to inspire in every visit to the tasting room. Over the last year, Outflow has been an object of curiosity within the brewery walls that inspires questioning and discussion of the nature of art in the tasting room. Louisa’s work embodies the very nature of curiosity and the joy of creative discovery, something that Creature Comforts as a brewery is always focused on. The brewery could not be more proud to have Louisa's work as the first semi-permanent art in the Tasting Room for is first full year of operations and is thankful to have had the opportunity to house this incredible work. Louisa was born outside of Washington, D.C. and spent her childhood in Chevy Chase, Maryland. She received her Bachelor’s degree in Environmental Design from the Maryland Institute College of Art in Baltimore, MD and intended to pursue architecture before shifting her interests to sculpture and moving to the South. Louisa received her Masters of Fine Arts in Sculpture from the Lamar Dodd School of Art at the University of Georgia in May 2015. Louisa has since moved back to her hometown of Washington, D.C. where she is growing a commission-based charcoal drawing business in addition to continuing with her sculptural work. Not long ago we had Michelle Fontaine paint a mural of our Crave Curiosity lightbulb logo on the side of our building. We didn't think twice about it before painting it on the Pulaski St. side of our building, and after it was up we found out it may have been better to do some thinking. The city very kindly informed us afterwards that there is a city ordinance that states a business may only have one sign per store front, and because we use this logo as a part of our brand, it would be considered signage and not art. Sadly, that meant we had to paint over it but we're pretty lucky that's all we had to do. However, there is good news! The city told us that there is a chance the ordinance could change in as quickly as two months from now, allowing businesses to have one sign per street facing wall. If and when the ordinance changes, you can bet we'll have Michelle painting that mural back up there. 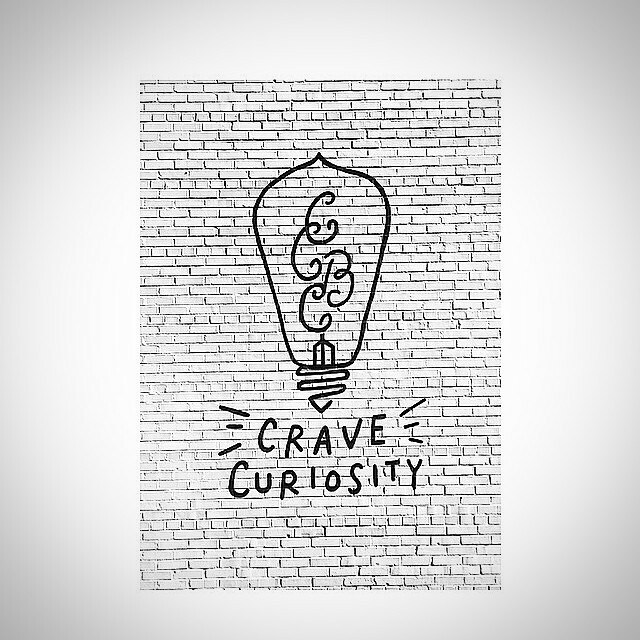 We all need a reminder to crave curiosity and to follow our passions everyday and this little piece of art is our way of keeping it on our minds. Thank you to the city for being so cordial while keeping us in line. Also, thank you for being curious and hopefully we'll bring some love back to the wall on Pulaski that can once again be immortalized in your amazing photos. Cheers!